This recipe is going to blow your mind (and your taste buds)! I've been making banana bread for years, but I must admit my original recipe contained pretty significant quantities of butter and sugar. As you know, those days are long gone for me. Still, I crave banana bread and I wanted to make a much more healthy version -- minus the sugar, of course -- to see how my family would like it. I don’t mean to brag, but my original banana bread recipe was pretty fantastic, so I had to keep testing and experimenting to try and match the original’s flavor and texture. I also decided to use the new recipe to make muffins, as portion control is easier and little muffins are the perfect size for little hands. Normally, I love cooking with wheat germ because it contains 23 nutrients (like potassium and riboflavin) and has more nutrients per ounce than any other grain or vegetable. It also has a high concentration of complex carbohydrates and protein which makes it the perfect ingredient for getting your day started right. It turned out to be a great addition. It adds great taste and makes the muffins super healthy. I was shocked at how light and sweet the new recipe turned out. When you try it, remember that the real key is using super ripe bananas. Our grocery puts the brown, spotty ones on sale several times a week, so I always stock up on them for recipes just like this! 2. Combine flour, wheat germ, baking powder, baking soda, salt in a bowl. 3. In a standing mixer combine the 3 bananas, agave, oil, vanilla and egg. Beat until combined and bananas are mashed. 4. Gently mix in the dry ingredients in 3 stages until just combined. Do not over-mix. 5. Grease or line muffin cups or mini loaf pans and fill 3/4 full with the mixture. 6. 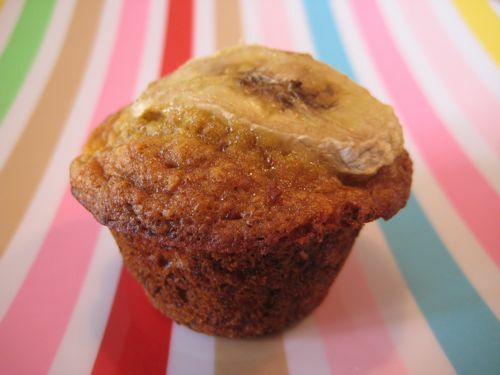 Place the slices of banana on top of each filled muffin cup or decoratively over the loaf pan. 7. 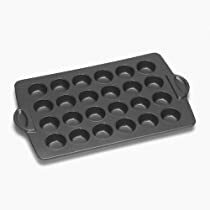 Bake 15 minutes for mini muffin cups, 20 for regular muffin cups or 25 minutes for mini loaf pans or until a toothpick comes out clean. Hi, I’m Catherine. Mama of three. A Kentucky girl living in California. Here’s what I know: all kids can be great eaters and mealtime must be easy. My passion is creating simple, healthy recipes that can be enjoyed by the whole family. My granddaughter loved these muffins and I was wondering if other fruits could be substituted. (Berries or pineapple?) If so how much of each fruit would I need? Thank you. At .38 weeks prego I was looking for an easy healthy muffin and I made these. So delicious! Thx, Catherine!. I just made these without the banana on top and added a little nutmeg. They are SOOO good. Thank you! Wow, these are delicious! I am a bit believer in wheat germ and am impressed that the recipe called for so much of it. Great recipe, and great recipes on your site. Thank you! wondering if you use wholegrain or regular flour? what do you use on most recipes? I use whole wheat and regular in more of my recipes. This recipe contains regular. You need it so it can be light and airy since it has wheat germ in it. My twins (13 months) love these, they ate 3 each as soon as they were cool enough, they could hardly wait the smell was driving them crazy! I am on the look out for organic wheat germ but can't seem to find it locally. I tried TJ's, WF, Sprouts, Henrys...but no one carries it. Any suggestions as to if/where it is sold? you can find it at mothers market. These just came out of the oven and they rock! Another winner, C. I can't believe how sweet and delicious they are with just 1/2 cup of honey and no butter! I am certain relinquishing this IKEA cabinet completely free and i'm only going to be buying a brand-new case soon. If you happen to would use it and may even presume within 2-3 days, shoot me a contact and I'll email you. WOW! These are soooo amazing!!! I added some raisins in there too and they really were astounding. Very moist, sweet and delicious! Can't wait to take these to a playdate. So interesting, how much salt did you put in them and what kind did you use? I have made this recipe a dozen times. I completely agree. Way too salty. I reduced salt to 1/4 tsp. YUMMMM!! We just made these this morning..huge hit and yum! Thanks for all the great ideas! I made these muffins today and I love to texture, but mine turned out too salty. :( I used 1 tsp like the recipe called for and 1/2 cup honey instead of agave. I wonder if using agave would make a difference? I'll try again using less salt! I used agave and mine were too salty also! I'm going to halve the salt next time. Unfortunately, Jeanne, this drug is making a lot of money for AstraZeneca. You can buy high-quality fish oil, at least as good if not btteer than Lovaza, at the health food store. Lovaza is a joke. I poke fun at it every chance I get! Made these the other day and my lil' munch (who is NOT a banana fan) ate 2! Great recipe because it makes one pan and is perfect for lil ones! (Oh, I used agave(for the first time) and was SUPER impressed with the results! Also used 2/3 c. regular flour and 1/3 cup whole wheat, no affect on texture! Could I add organic oats, or would it mess up the texture? I sub oats (ground to a flour) for the wheat germ and love it! Just made these and added Butternut squash (I have a TON of it right now) instead of the third banana and 1.5 oz wild blueberries ... YUMMY! I did find I needed to set the oven at 325 for 13 minutes, but I think my oven runs hot. The first batch came out a little hard and crusty. Made this in a bread loaf pan and it was delicious - my 14 month old ate almost half the loaf for breakfast! Thank you for such a healthy recipe to the butter/sugar-filled alternatives! A little late, but I made this using applesauce (unsweetened) instead of oil, and half wheat flour and half white flour. So delicious!! My little man loved it even more than the normal, butter-laden muffins that I usually make! (all the exclamation points are to show just how smitten I am with this recipe). These freeze GREAT. I doubled the recipe and baked it, then froze it so that I could re-heat it for breakfast whenever I needed. He asked for these muffins even more than sugary cereals or pre-packaged goods! How much applesauce did you use as the substitution for oil? DANG! These are for serious! I'm trying to clean out the pantry before I move and needed a recipe to use up some of my wheat germ! These are truly incredible! Instead of banana slices on top, I generously topped them with frozen blueberies. Truly incredible. This recipe is a keeper. How many muffins does this make? Those are amazing! I ate four of them right out of the oven! I'm not a honey fan so I substituted with maple syrup! Great recipe! where do you get muffin liners for the mini muffin tin? These cooked faster than the stated times for me, so watch them! I was about 12min @350 for mini muffins and 20min @350 for mini loaves. i had a bunch of over-ripe bananas and searched weelicious for a recipe. my 2 year old just helped me to make these for our very first time! they turned out perfect! i can't believe how amazing they came out. i'm such NOT the cook or the baker. in fact, this was the very first time my daughter helped in the kitchen... so i could definitely see the wheels turning in her head... oh, so we count how many spoonfuls of oil, oh the mixer is mixing everything, oh - i turned bananas into muffins, oh - the oven is hot, etc....and finally, OH, I'M EATING MUFFINS I MADE WITH MOMMY! thanks so much for sharing and perfecting this recipe. These are FANTASTIC!!! Thank you so much. I love your site. My husband and boys love these. I use Adams creamy pb, Bob's Red Mill Old Fashioned Rolled Oats, Clover honey, and Whole Foods Organic Coconut Medium Flakes and it works perfect. I keep them in the fridge, covered and use them as a snack! Delicious and nutritious. Hi Catherine! I was just wondering if it made a difference if you used toasted wheat germ or raw wheat germ in your banana wheat germ muffin recipe?? Thanks so much! These are delicious and a big hit in our house, especially with the almost 2 year old. I sprinkled a few enjoy life mini chocolate chips on the top of a few of them. I might just fold some into the entire batch next time. Thanks for the great recipe! We will be making these over and over again. These look great! I'm going to make them this week but am wondering if I can use something in place of the honey, as I plan to give some to my 9 month old. I wouldn't even mind using a little sugar but then I'm not sure if I need to add some more liquid? Thanks in advance! You could use agave instead of honey! You could use white or brown sugar, but then you'd have to increase the other liquids. So maybe 1/3 cup brown sugar, and 5 tablespoons of oil. These are awesome! I topped each with a couple mini white chocolate chips. So good! Made these tonight with a few adjustments. Used half whole wheat and half AP flour. Used have honey and maple syrup (just because I got tired of squeezing the honey). Added only 2 bananas because that's all I had and added 1/4 cup mini chocolate chips and walnuts. Absolutely delicious! I think next time I could use less sweetener because the ripe bananas make them plenty sweet. This one is a keeper! can these be frozen? if so, what's the best way to do that? Yes! I bake them, then place on a sheet tray in the freezer until frozen (about 30 minutes), then transfer to a labeled freezer bag for up to 3 months! These were super amazing delicious! Granted I added chocolate chips. I love the texture the wheat germ gives them! could I use wheat bran instead of wheat germ? I just love these; this recipe has become my go-to banana bread/muffin recipe. So yummy AND nutritious. Proof that \"healthified\" can taste just as good, if not better, than the more standard, unhealthy versions! Your recipe sounds nice but would I be able to substitute the agave or honey for brown rice syrup as I already have some? Could I substitute the oil for something like natural yoghurt or applesauce? I'm cooking for a young baby. I just made these and used 3 over ripe bananas but didn't have enough vanilla or honey so the taste was a little off because they weren't as sweet. I will definitely make this recipe again they still have a great flavor to them, I'll just make sure I have enough honey next time for the right amount of sweetness. Family favorite! Thanks. Love that the sweetner to flour ratio is small and that the honey really tastes so well in recipe. I sub'd half cup of apf for millet powder each time we ve made it. These are delicious and moist! How many muffins is the nutritional info for? Catherine, these are wonderful!! My 18 month old boy/girl twins had a couple for a snack. I think the whole Tbsp. of vanilla is perfect! Really adds a great flavor. Do you think one could use half AP flour and half wheat germ for cookies too? Thanks for so many easy and delicious recipes! These were delicious. My daughter ate them, so I'll be making them again.